This recipe is the result of On the Road: The Farm Stands of Salem, N.J. This All-American favorite is given a mildly exotic flavor with the addition of lemongrass, ginger and star anise. Feel free to skip these additions and make plain peach butter. It’s simple to make. The key is ripe peaches. If your peaches are not ripe, place them in a brown paper bag and leave out on your counter until ripe — usually no more than a day or two. In this recipe a syrup is infused with aromatics and the solids strained out. This syrup is combined with fruit. Use peach butter on toast or a scone, mix into fresh ricotta or use it as a glaze on grilled chicken breasts – brushing the breasts just before removing from grill. Do ahead Peach butter may be stored in refrigerator for four weeks. 1. Combine sugar, water, lemongrass, ginger and star anise in small pot, bring to simmer and simmer slowly for 30 minutes. While doing this, make sure you do not boil away liquid. Off heat and strain out solids, reserving liquid. Measure liquid and add water to bring to 1 cup if it is less than I cup. If you have more than 1 cup, don’ t worry about it. It will cook away in Step 2. 2. 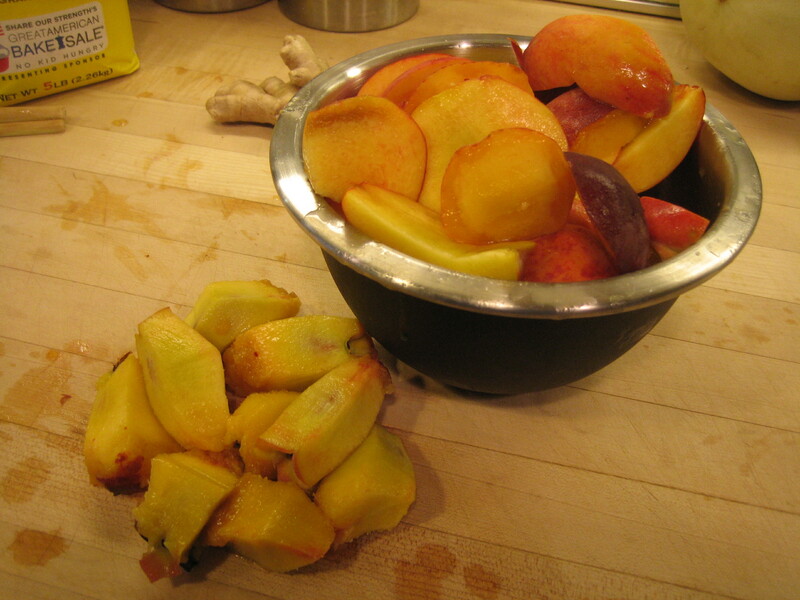 In a heavy bottom pot large enough to hold peaches, combine peaches and liquid. 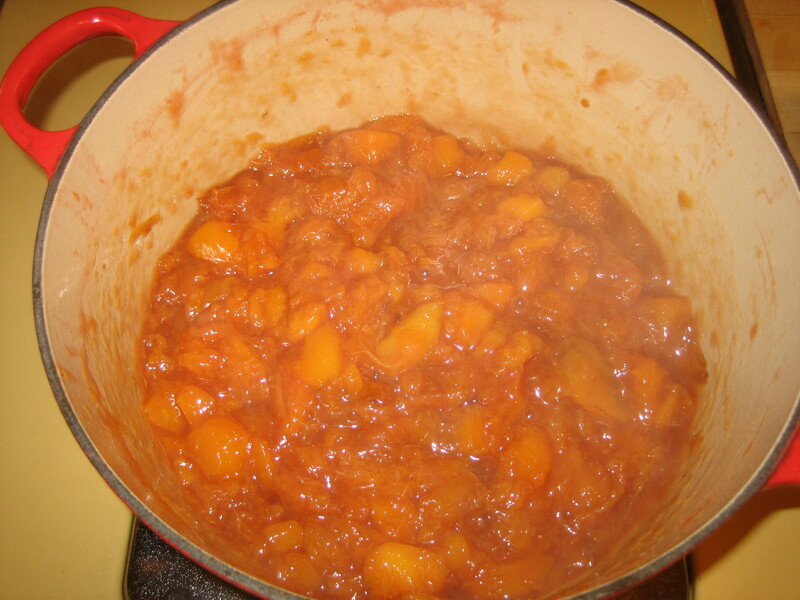 Cover and bring to simmer for about 10 minutes to soften peaches and render liquid. Remove cover and continue cooking over moderate heat to thicken. 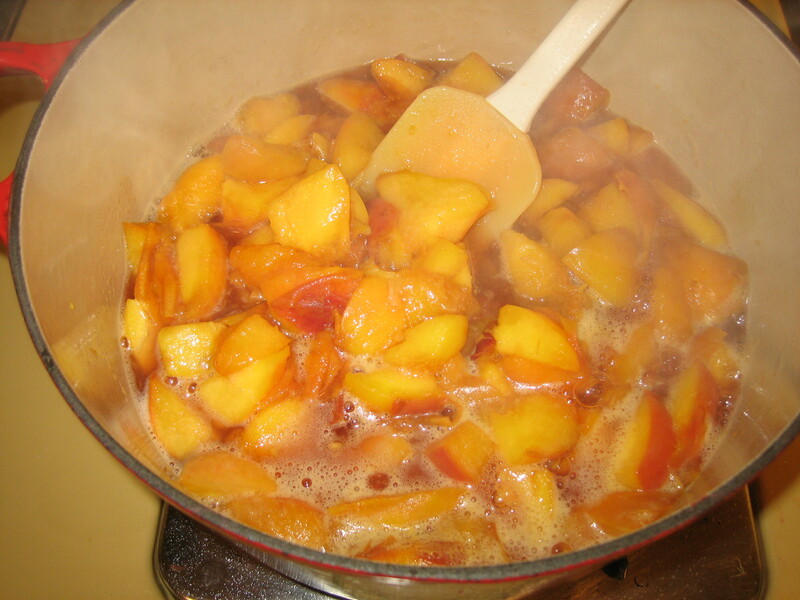 As mixture thickens and peaches begin to disintegrate, reduce heat and stir to make sure peaches do not stick to bottom. When mixture is very thick, remove from heat and allow to cool. 3. Transfer to work bowl of food processor and pulse until smooth. 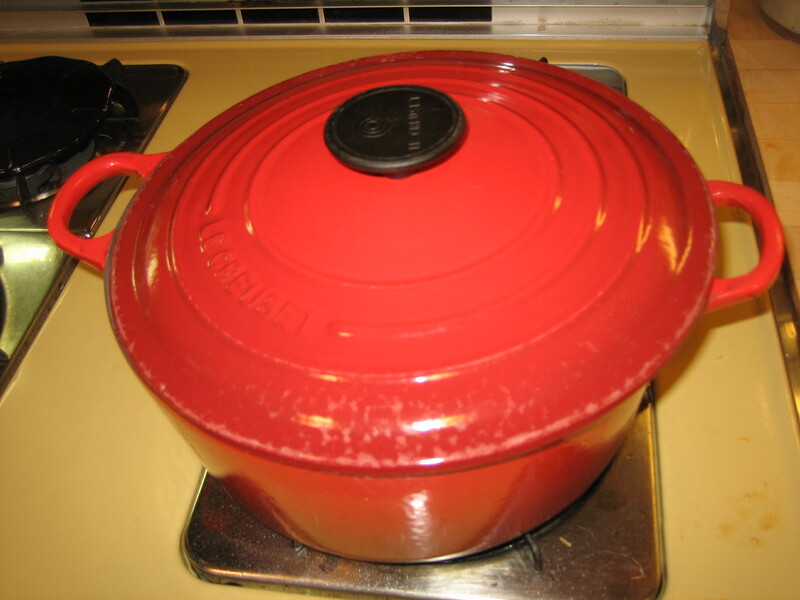 If butter seems too thin, you can return it to your pot to continue cooking, but be very careful not to scorch bottom. Place in storage container and refrigerate. Note: A fruit butter is a smooth, very thick puree – usually sweetened with sugar. 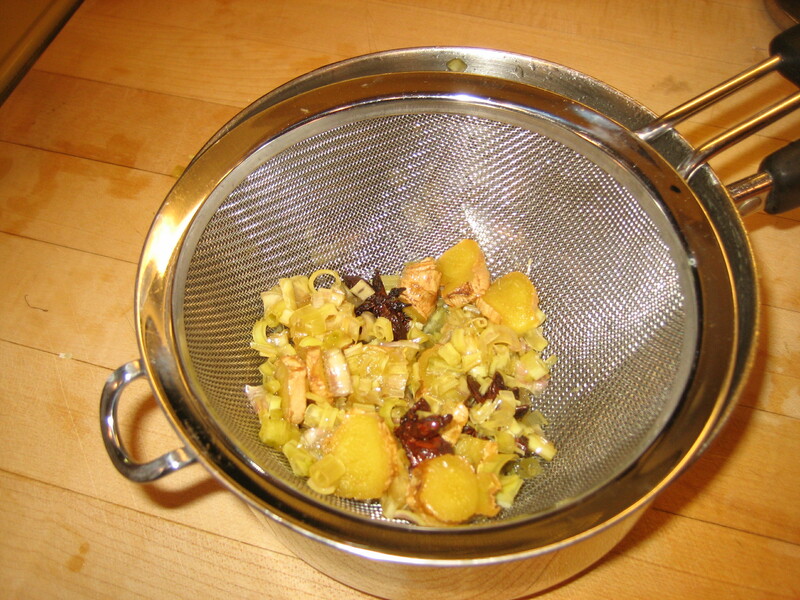 This same process can be used to make other fruit butters. 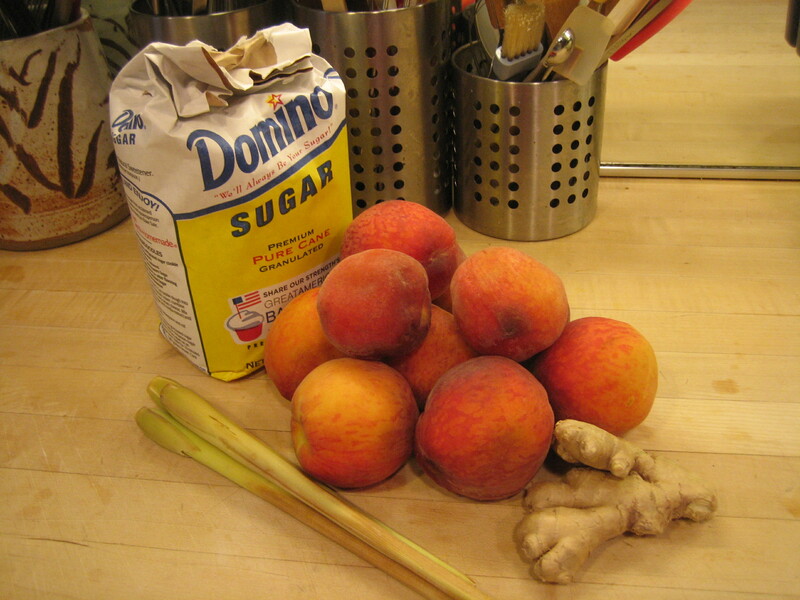 Fragrant peach butter uses ripe Jersey peaches, lemongrass, ginger, sugar and water. Early Jersey peaches are “cling,” meaning that the peach flesh clings to the pit. Using a sharp paring knife, cut the flesh away. Some flesh will be left on the pit. 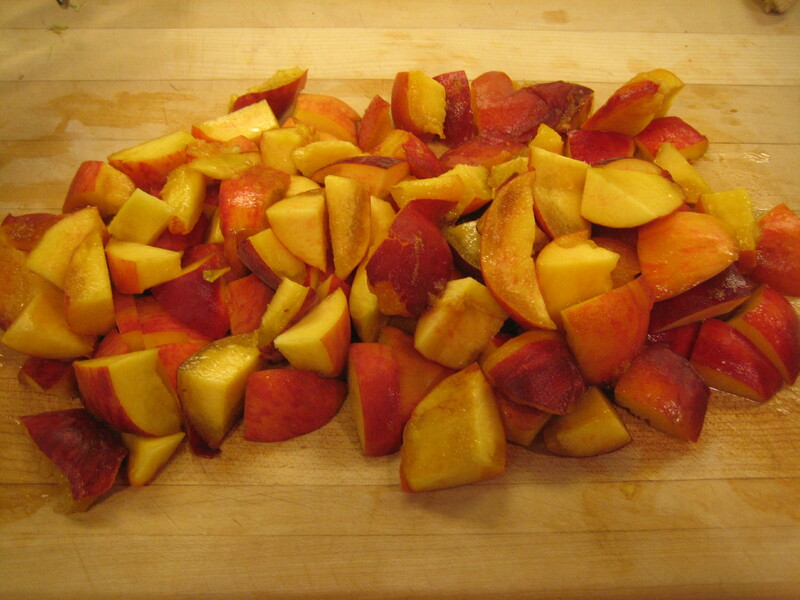 Cutting up peaches into smaller pieces enables them to cook more quickly and evenly. 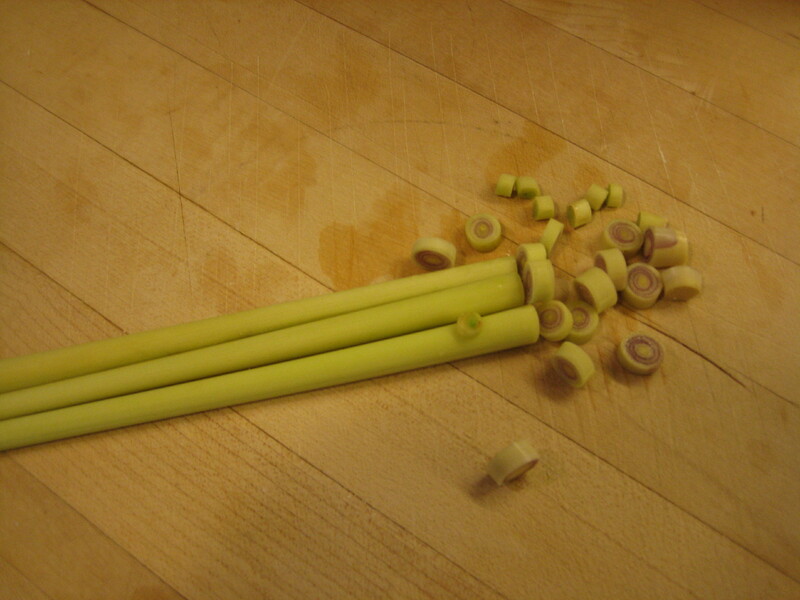 Trim away the tough outer leaves of the lemongrass stalks and then cut thin slices. Bruising lemongrass with a meat pounder enables the lemongrass to more readily give up its flavor. You could use the bottom of a heavy pot or even a hammer. After lemongrass, ginger and star anise are cooked in syrup to release their flavors, the solids are strained from syrup and discarded. 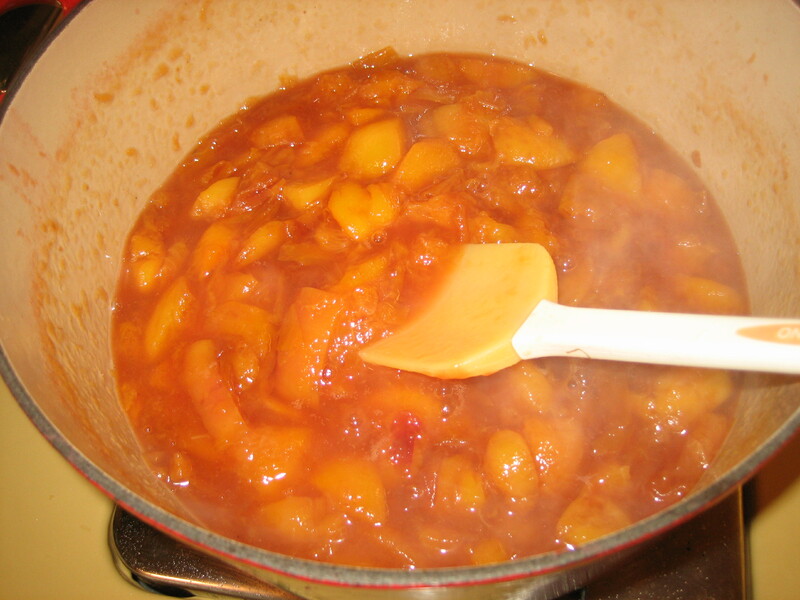 Transfer peaches and infused syrup into a thick-bottomed pot. 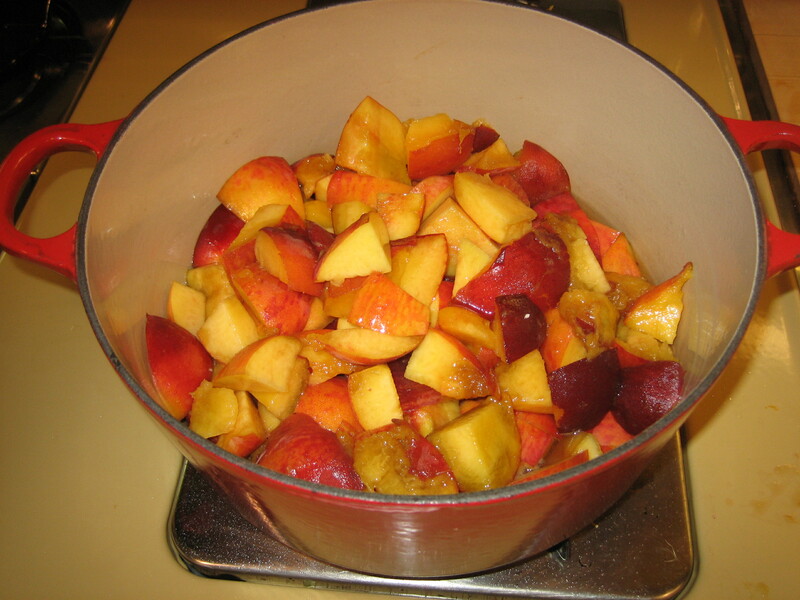 Cover and cook over moderate-high heat for about 10 minutes until peaches render their liquid. It will now be more “watery” than before peaches rendered liquid. This hastens the process of removing liquid, leaving you with a thick fruit butter. While there is still lots of liquid, you can cook over moderate heat to begin process of boiling away liquid. Take care to occasionally stir to prevent peaches from sticking to bottom and scorching. As it thickens, reduce heat and stir more frequently. As the peaches cook, your butter will require more attention and frequent stirring. You will have a sense that it is thick enough when you run a rubber spatula across the bottom and a bare strip of pot remains visible for a moment before filling back in. My peach butter took about an hour to cook down, but cooking times will vary based on the size of your pot — a wider pot will enable quicker evaporation of liquid — and your cooking temperature. If after you process your butter in a food processor it still seems to thin, you can return to pot to thicken it further. Here’s the finished Fragrant Peach Butter. See the At Home blog for this recipe and more than eighty recipes published on the blog. Next week: On the Road: The Trenton Farmers Market and the Farm Stands of Mercer County, N.J.
A good cranberry sauce should balance the natural piquancy of cranberries without being puckeringly sour. It should have a texture in which you can clearly differentiate the cranberries — with a lots nearly whole so that the berries pop in your mouth. Cranberries and oranges have a natural affinity that can border on cliché. This sauce uses orange peel to add character to the taste of orange and a generous amount of ginger to add another layer of flavor and a slight undercurrent of heat. Use this cranberry sauce with your Thanksgiving turkey, add some to post-Thanksgiving turkey sandwiches or use with roast pork or grilled chicken. Do ahead Sauce may be fully made and refrigerated up to three weeks. 1. With a vegetable peeler, remove the peel from one half orange taking care not to remove the white pith. Make several piles of peel. If the peel strips are long, cut in half lengthwise to make cutting more manageable. 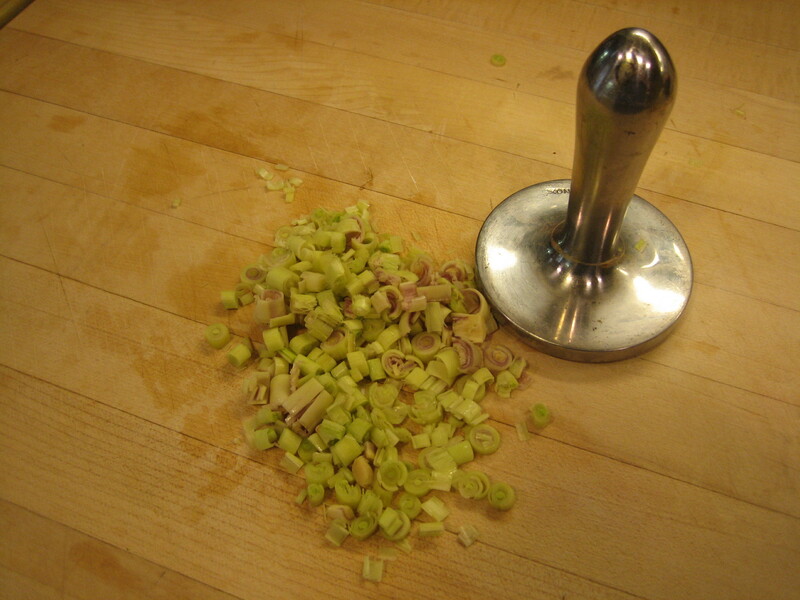 Cut stacks of peel into a julienne (thin strips) of irregular thickness. Cut julienne into irregular, but small pieces yielding 1 1/2 tablespoons. 2. Peel ginger completely removing tough outer skin. Dice ginger into small, but irregular pieces yielding about 2 1/2 tablespoons. 3. In a 1 1/2 quart pot, combine orange juice, sugar, orange peel and ginger. Bring just to a boil and immediately reduce to simmer. Slowly simmer for 10 minutes to infuse mixture with ginger flavor. You do not want to reduce liquid. 4. Add fresh cranberries to pot. Increase heat to moderate. Stir occasionally and cook for about 7-10 minutes as cranberries pop and begin to break down. Berries will continue to break down in the hot liquid as it cools. Remove from heat and stir in dried cranberries. Chill. Serve cold or room temperature. Adjusting thickness of cranberry sauce: This cranberry sauce should have a firm consistency so that it will hold its shape on a spoon and then fall off when you tilt the spoon. If it just sits on the spoon it is too thick. Thin by stirring in a little water, but take care that it does not become runny. *Leftover dried cranberries make an excellent addition to a mixed green salad with some walnuts and fresh goat cheese. Numbers of readers have offered great suggestions for our list. Please post your suggestions for What Guests Can Do To Help on this blog by using the “Leave a Comment” under this post or send an email to me at steve@athomebysteveposes.com. I need your help now to come up with a great list to share with Thanksgiving hosts and I will need your help later in sharing the list. Let’s work on this together over the next two weeks. For the Organized Entertainer looking for their one relaxed hour prior to guests arrive for Thanksgiving, this coming weekend is a key time to get lots done. Our Thanksgiving Planner tells you what. Our Top Ten Thanksgiving Host Pitfalls and to how to avoid them plus our Thanksgiving Planner is available at athomebysteveposes.com. The last chapter in Section 4 — More Elaborate Entrees is Chapter 12 — Poultry & Meat Entrees with fourteen recipes. It’s hard to pick favorite recipes. But there are certain recipes in At Home that do have a particular association. Manou’s Boiled Chicken is one of a handful of recipes that come from special people in my life…but being a special person alone did not qualify for their recipe’s inclusion. It had to be a special recipe. 4 To serve: If chicken and stock are still warm, place chicken on platter and pour a little stock over it to moisten. If you cooked chicken well in advance and it is now cold, refresh chicken in a pot with stock over moderate heat until just warm. Add salt. Garnish with scallion and remaining cilantro leaves. Serve with relish and rice on the side. Variety, as they say, is the spice of life. Varying your dishes spices up the look of your food. We sometimes like to serve an entrée in a large wide soup bowl, which gives the presentation a bit of unexpected, restaurant style drama. Try it at home. Born into a family of assimilated Jews living in suburban New York, I felt little connection to my ethnic heritage. Ever travel-willing and curious, I joined a “mission” to Israel that a local organization was sponsoring. We’d been in the holy land for nearly a week when we headed to the mountain fortress of Masada, where legend has it that 960 Jews committed suicide rather than submit to the Roman Tenth Legion and accept Roman rule. After a brief float in the Dead Sea, we drove north through the Judean hills (of the Dead Sea Scrolls) toward Jerusalem. Our arrival there was carefully timed for Friday’s sunset, the beginning of shabbat and the procession of yeshiva students praying at the Western Wall—the surviving section of Solomon’s ancient temple and Judaism’s most sacred site. As the sun reached the horizon, our bus continued up hills straddling valleys with familiar Old and New Testament names. We turned a corner and suddenly below us was Jerusalem, a city with buildings of native pink stone. The glow of the setting sun reflecting in the pink stone created a light that can only be described as biblical and indelible. Tomorrow: Countdown to shipping continues with the beginning of the preview of Section 5: Accompaniments with Chapter 13 — Room-Temperature Accompaniments and twenty-one guest-pleasing recipes. A week from today the books will be on the road from Kentucky to me — all 66,000 pounds of them. That means just about two weeks to buy the book and receive a signed, numbered first edition. A bit of fresh ginger and five-spice powder enhance the natural sweetness of that hourglass shaped fall staple, butternut squash. Serve in an acorn squash bowl for a stunning presentation. do ahead Soup can be made up to four days ahead, stored in the refrigerator and reheated. 2 Place squash on a baking sheet. In a small bowl, combine 1 tablespoon ginger, 2 tablespoons oil and the five-spice powder. Rub squash with spice mixture. Roast squash in oven until tender, about 30-45 minutes. Remove from oven and allow to cool. 3 In a large skillet, heat remaining oil. Add onion, celery, carrot and remaining ginger and cook until vegetables are soft, about 10-12 minutes. 4 Scrape squash from skin and transfer flesh to blender jar. 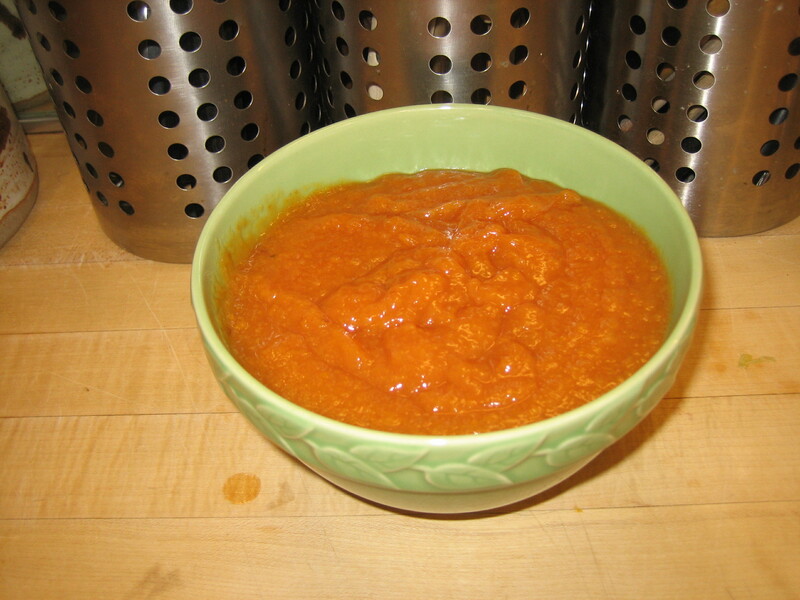 Working in batches, combine with cooked vegetables and vegetable broth and blend until smooth. Transfer blended mixture to a large soup pot. 5 Season mixture with salt and white pepper. Over a moderate flame, bring soup to a simmer, then stir in cream. Serve in warmed bowls. 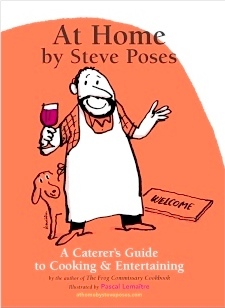 We’re down to 14 days until At Home by Steve Poses: A Caterer’s Guide to Cooking & Entertaining ships from Kentucky. That means 14 of 19 chapters still to preview. Section 2 is all about Getting the Meal Started. It includes three chapters. Chapter 4 — Soups offers thirteen delicious soup recipes plus a spread about Mastering Soup Purees. Chapter 5 is Tossed Salads & Dressings. Chapter 6 features Composed First Courses — cold and room temperature recipes meant to be arranged, ideally on individual plates. You may have noticed that our recipes are presented in a somewhat unconventional way. I always objected to the standard presentation of listing recipes in the order of the recipe steps when you have to do things to ingredients before you even get to the steps. In a kitchen we do all of the chopping, dicing, etc. in advance of starting the actual cooking or assembly and I think that way makes the most sense. So, our ingredient list always starts with those ingredients that have implicit steps like chopping, etc. In addition, the ingredient is presented in boldface so that it is easy to scan an ingredient list. Finally, in the recipe steps the first time you use and ingredient, the ingredient is presented in boldface. I think it’s just a smarter way to present a recipe. So, what follows is a recipe, note — today it’s a bottom note. Bottom notes are occur occasionally throughout the book and are autobiographical. Then, of course, there’s a Pascal Lemaitre illustration. View more recipes from At Home. On the evening of April 4, 1973, my little Frog was born. It would be years before I’d actually place a sign on the building. Instead, we were “the place on 16th Street with all the plants in the front window.” Highlights of Frog’s opening-night menu included onion soup, calf’s liver with mustard sauce and rack of lamb lifted from La Panetière. Our paella and canneloni recipes came from a Time-Life cookbook. My mother made a batch of her stuffed cabbage. The wine list included bottles of Mateus and Mouton Cadet, plus several selections by the glass—a Philadelphia first. On other nights we offered quiche, brochette of beef and Thai chicken curry, a blend of spices and French béchamel. It was the birth of what became known as fusion. By today’s standards, it wasn’t much. But served by energetic kids anxious to please, the food at Frog, and the restaurant itself, was something new, a soldier on the front lines of a restaurant revolution. Versions of Frog would appear in cities across America. This is Pascal’s illustration for Mexican Clam Chowder. Tomorrow: I am going to skip ahead to Chapter 10– Braises, Casserole & One-Dish Entrees — so that I can share my recipe for Holiday-Ready Brisket in plenty of time to plan for your Rosh Hashana. Looking ahead – Sunday we will pick-up our countdown order with Chapter 5 – Tossed Salads and feature our recipe for Fatoush – our chopped version of the traditional Middle Eastern tomato and cucumber salad with a wonderful dressing of lemon, mint and olive oil. If you purchase a book between now and the end of the month you will receive a signed, numbered first edition. Books will never be available in bookstores. You can buy it now in our online shop. Who knows, one day that may be a collector’s item and you’ll be able to sell it on eBay for big bucks! When you buy the book, you will receive access to our At Home Online. And just wait until you see that! If you are enjoying these posts, please pass them along to friends and family. If you are visiting the blog site each day, you can sign-up and have posts delivered to you via email. You can sign up at www.athomebysteveposes.com or on the blog site.